← Ignore A Previous Post – Please! I am always scouring The Duquesne Times or Observer for interesting tidbits of information to share with you. 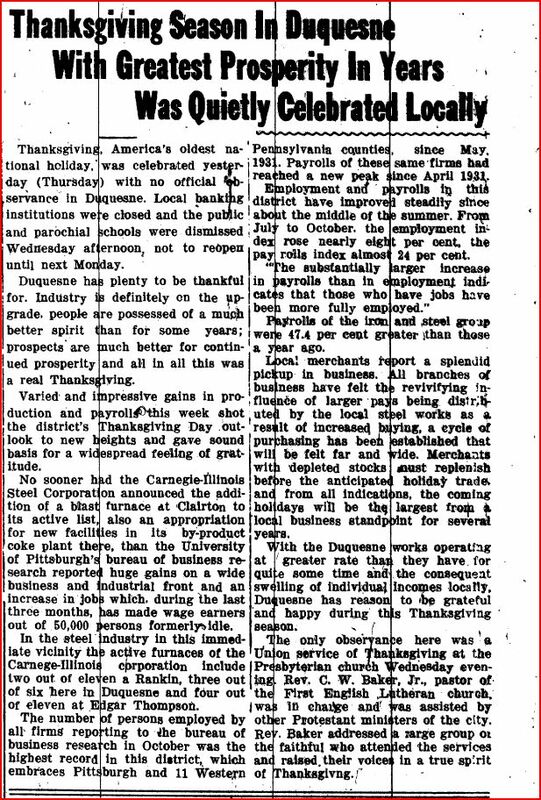 As I was rummaging through decades of issues, I came across some interesting facts about Thanksgiving in Duquesne. 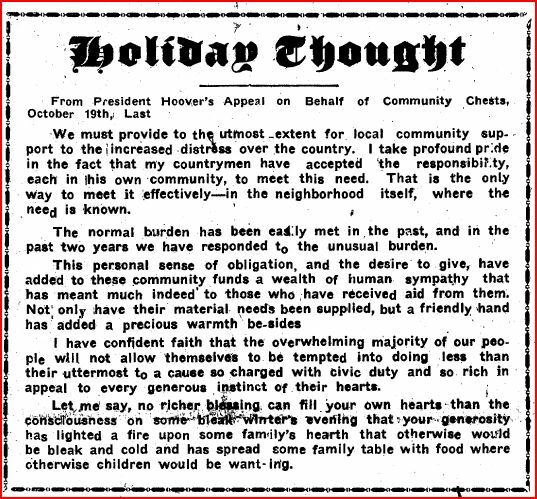 For instance, in the November 23, 1900 issue of The Observer, an article outlined the fact that not all businesses were closed on Thanksgiving Day. The Post Office observed shortened hours, although some merchants closed their businesses early, many were open for their regular business hours. Banks were closed, but telephone and telegraph offices, freight and shipping stations, and of course, the mills, were open for business as usual. 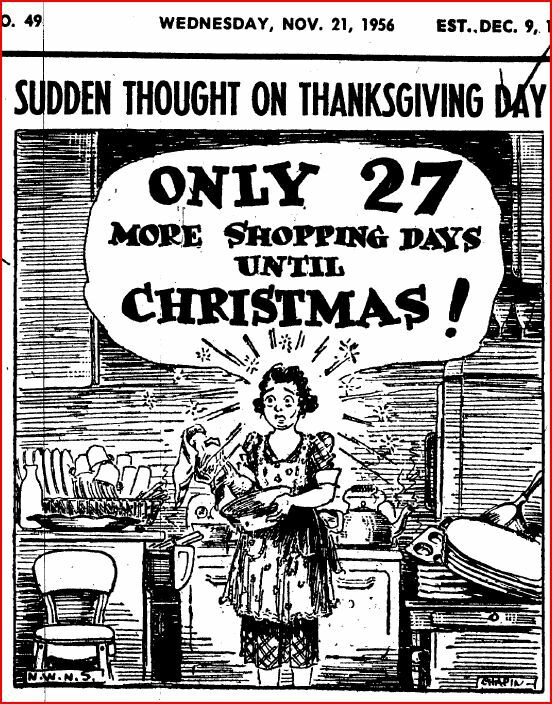 (Doesn’t make Wal*Mart and other stores being open on Thanksgiving Day this year such a shocker, does it!) 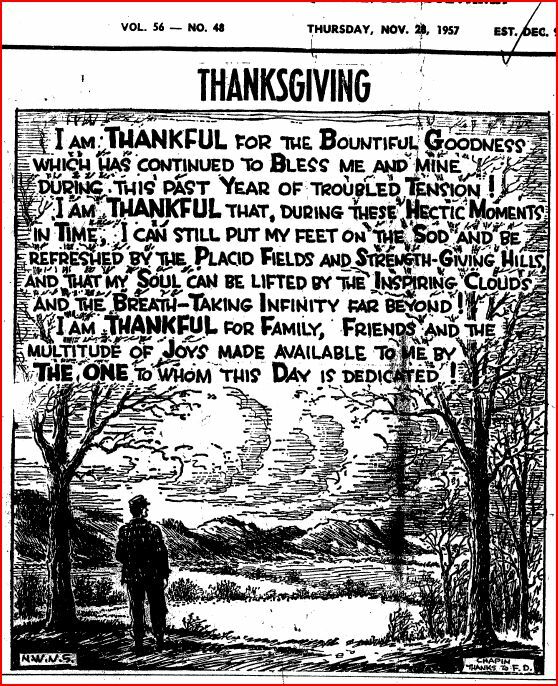 In 1900, for those not working, the day meant church services, turkey dinners, daytime football games in nearby cities and evening dances. 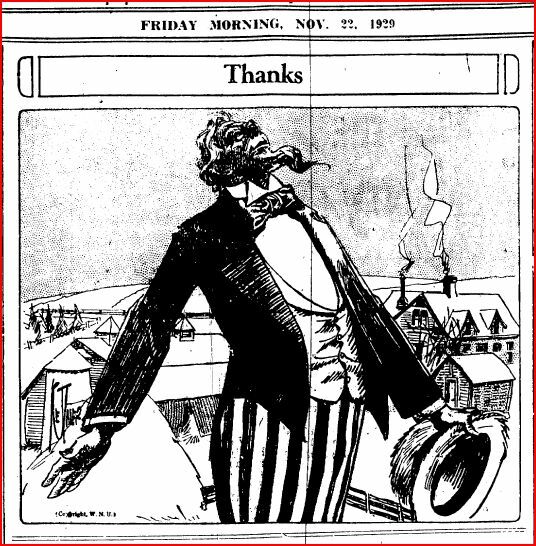 By 1910, the paper validated that virtually all business and the post office had begun closing for the day. The steel mills however, continued to function non-stop. In my family, real Thanksgiving traditions were rather obscure. The day would progress as most any holiday celebration throughout the year. While Mom, Steve and I would park ourselves in front of the TV to watch the Macy’s Thanksgiving Day parade, my dad would take over breakfast duties. Bacon, eggs, pancakes were always on the menu. In those “pre-cholesterol worry days,” heaps of real butter, Log Cabin syrup and eggs fried in bacon grease were always part of the menu. Today, I’m sure I’d either go into sugar shock or feel like there was a lead weight in my stomach if I ate a breakfast like that! While my parents prepared to cart us off to Grandma and Grandpa’s house, I remember sitting at the kitchen table making a Thanksgiving decoration out of a potato. Using toothpicks, construction paper and crayons, I would try to “build a turkey” to take to our Thanksgiving feast at my grandparents. Although it was always rather “Picasso-like” in its appearance, it was MY tradition. Once we arrived at my grandparents house on Duquesne Ave. in West Mifflin, my mother and all of my aunts went into “auto-drive.” They’d all march into the kitchen and go about their meal prep assignments. It was like a room full of Harriet Nelsons, complete with 1950 dresses and frilly aprons! Aunt Peg and Aunt Helen had begun preparing, stuffing and roasting the mammoth turkey in the pre-dawn hours. The remaining tasks were preparing the side dishes, baking the rolls, setting the table and so on. In the meantime, all of the guys would park themselves in the living room and begin watching the football games on TV, toasting the holiday with shots and beers, and basically assuming the male-chauvinistic posture of the era. They would spend their pre-meal time arguing about the game, making their plans for their post-Thanksgiving deer hunting expedition and discussing “the good old days” and growing-up in Adrian, Pa in Armstrong County. By the time the guys were getting a bit “hammered,” it would be nearing dinnertime. My dad, as the eldest son in the Volk family, had the responsibility of carving the turkey. He would carefully slice the bird and divide the meat into light and dark platefuls of juicy goodness. By the time he was finished, the ladies had prepared the gravy and everyone was called into dinner. Of course, the children were relegated to the “kids table” in some remote corner of the kitchen, while the adults gathered around the oversized, makeshift banquet table. I always felt sorry for my aunts during the meal. They would normally sit near the stove and constantly bounce up and down from their seats, refilling the bowls and platters of food, as they were practically inhaled by everyone. No one walked away from the table hungry. The food just kept on coming until everyone was satisfied. In the meantime, all of the husbands would practically be in a tryptophan induced coma in the living room for hours. The only way they were awakened, was through the enticement of dessert! Everyone would re-gather at the table and enjoy the numerous pumpkin pies that my aunts had prepared. The sounds of Reddi-Whip aerosol cans squirting mounds of whipped cream on top of the pies filled the room. There was always someone trying to squirt the whipped cream directly into their mouths, only to be yelled at by one of the aunts! Some things were so predictable! After approximately an hour after enjoying the wonderful desserts, platters of sliced turkey, dinner rolls and other leftovers would re-emerge and make their way back to the table. One by one, everyone began gleaning the remaining food. Turkey and stuffing sandwiches, additional pieces of pie and every other left over made their way back onto plates and into the stomachs of all those attending. And so went our Thanksgiving Day, and as I stated earlier, a blueprint of practically every other family get-together throughout the year. So here’s to good food, families and the good life in Duquesne. We had so much to be thankful for! This entry was posted in Autumntime, Holidays - Non-Christmas and New Years, My Hunky Family. Bookmark the permalink. 10 Responses to Happy Hunky Thanksgiving! Good article Jim. And I have to say, the women were glad to be rid of the men for most of the day. They were able to gossip and drink coffee while the men were out of their site. It was a day to truly give thanks! I so look forward to reading The Duquesne Hunky! It is a replica of our growing up in good old Duquesne. Though we were Irish and German, so no hunky food in those days, most of us have adopted the food and many customs. GO BEARS and thank you Jim! Mame, please tell your mom hello for me!!! Except for the annual Friday night football tussle, I’ve always fostered a tender spot in my heart for our smoky neighbor Clairton. 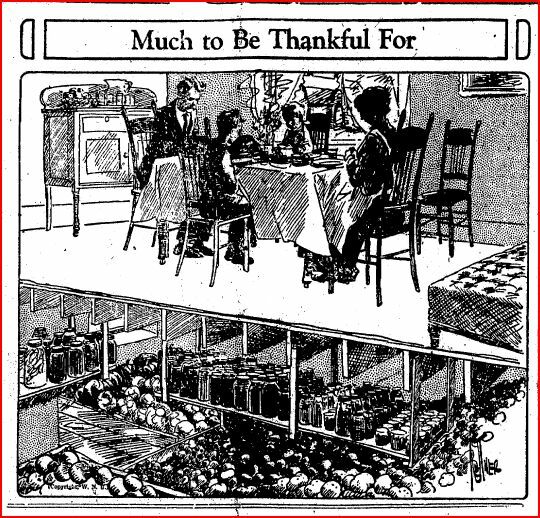 In your Happy Hunky Thanksgiving post, the Duquesne Times article mentions Clairton’s good fortune in being the recipients of a new blast furnace – something that would indeed bring much joy to all who endured the hard life in the Mon Valley. It is enchantingly coincidental that this very day (Nov 21) USA TODAY (sports section) carried a two page article titled, “Clairton rises up with a big bear hug” describing the football team’s 59 game winning streak. Wishing Clairton and Hunky’s everywhere a Happy Thanksgiving. Woohoo Clariton! Our wonderful hunky neighbors! Jim, I’m thankful for all you’ve done with your blog. I have to believe you’ve brought alot of joy to alot of people, their families too, who may have never reflected on their Duquesne life with such fondness. I’m included in that group. So, as to what I’m thankful for, I’ll add you and your blog to my list. May God bless you and yours this holiday. And remember you’re not alone, you’re always in the thoughts and prayers of all of us. Thanks Bob – Best wishes for a wonderful holiday season to you and yours as well! Thanks Jim. 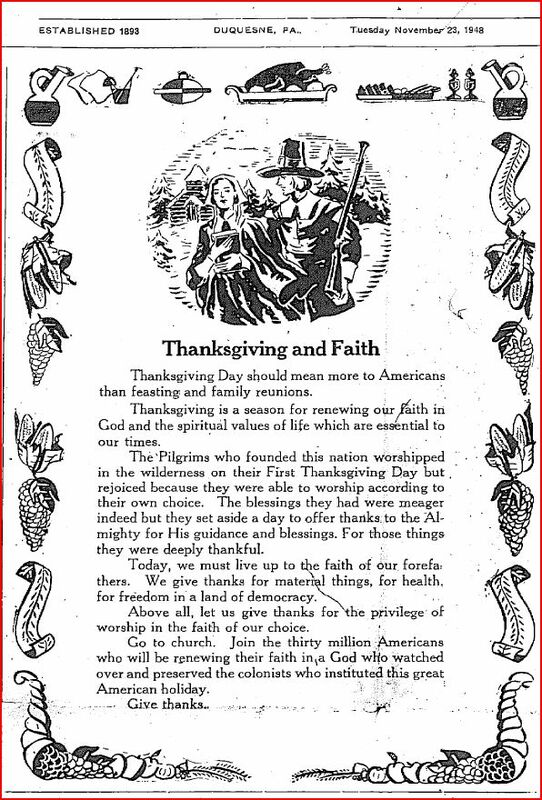 It really was a rememberence to all those Thanksgivings of yore!! The video and pics were fun to see. 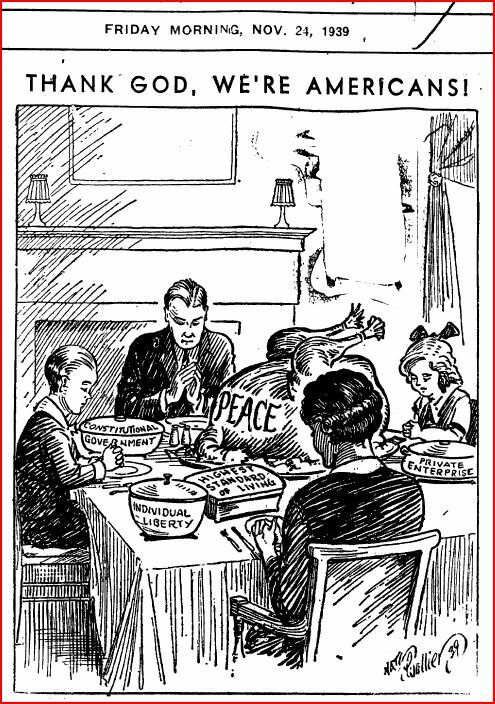 A very Happy Thanksgiving to you and the family. We get to do a small 16 person Thanksgiving at our house this year. Have a great time Michael. This year I’ll be going it alone on Thanksgiving.